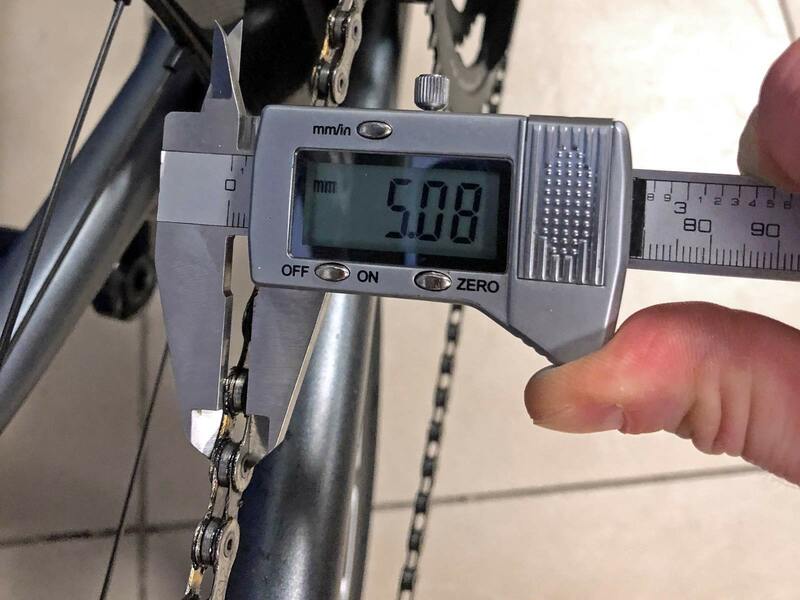 Just when I'm ready to go from 9 to 11.
fwiw...campy 11spd are nominally 5.5mm width. i'm still a 10spd sorta guy, outside looking in with a comfortable level of detachment! When I'm ready to buy another bike, I'll "upgrade" to whatever the latest number of gears available. Until then, I'm still riding 9 speed. I've been a reluctant gear upgrader. I rode 7 speed for a long time past it was fashionable. I only 'upgraded" when I ran into too much trouble finding replacement parts. The solution was to buy a new bike! I love the new bike (lighter & shift faster) but didn't find the 2 extra gear made much noticeable difference. My three road bikes are 7, 9 and 10 spd. Sigh . . . When I went looking for the used Chorus to put on the Victory, I had 10 speed as an expectation. When I saw the 11s with the Record Titanium calipers including the entire 11s Chorus group otherwise, my first offer was stricken down. Due to the Record calipers, the condition and the chain/cassette included. I went back before it was gone. At his first counter offer and ponied up the 450.00. Orig $500.00 asking was not as bad as used eBay groupo prices. I realized my $400 offer in this condition would have been good for the 10s I had on the brain. Then looked used 11s and realize there was quite a hop in price 10 to 11 used. In fact not much 11s Campy out there used. The fact that 11s Shimano and 11s Campy cassette spacing is so close as to be a swap/plug/play, I can sell the 12-27 cassette and lock ring. I have no Shimano wheels. not to mention 10s Shimano spacing works if I use a 11s chain on 10s shifters FWIW. Just uses 10 of the 11 cogs. BTW, the dual pivot front and single pivot rear Record Calipers have a great balance in modulation and power befitting each position IMO. I don't like 11 tooth cassettes, so for me its an 11 speed. 53 x 11 @ 125 RPM = 50 MPH,80 KPH What's not to like? This was pulled from the gear calculator posted the other day. It appears the site remembers the last setup. When I moved the big ring I left the small ratio 22 x 36. I dont intentionally try to exceed what gravity and girth provide me on a tucked descent these last few years. ...and a 12-27 or 12-29 cassette, I think I could be motivated enough to switch from 10 to 12 speed. It's interesting that the only two cassettes they're making initially are 11-29 and 11-32. Perhaps they're trying to cater to us ageing Boomers without scaring away the youngsters. Super Record Disc - $3600 - 2323 gr. Super Record Rim - $3195 - 2041 gr. Record Disc - $2750 - 2453 gr. Record Rim - $2175 - 2213 gr. The Record rim brake group seems like a relative bargain. It's only 172gr. / 6 oz. heavier than Super Record and $1020 cheaper. It's interesting that there's not as much difference in price ($850) or weight (130 gr.) between the disc groups. "I dont intentionally try to exceed what gravity..." Yeah, I'm glad I moved away from the neighborhood with that short steep stretch on the outbound side, fun while it lasted though. I may have one less gear on my ticker due to a beta blocker for the aneurysm, so I may want to compensate with a bigger cog on the cassette, but I don't need 12 to get there. ...for 2 grand? I imagine that would only cover a few months of the lease on the Alfa you're looking at. Considering that you just got a new 11-speed bike, it wouldn't make a whole lot of sense to switch to 12-speed. For those of us still in the 9 or 10-speed camp, an upgrade may be more worthwhile, as much to replace worn parts as to get the extra gears. However, I'm going to look for killer deals on Campy 11-speed before making any moves. at this level, every $2k counts! This gives ma an excuse to put off upgrading my 9 speed. I'll wait until there is a 30-46 crank or rings I can use, a 12-27 heavy steel cassette, and chorus level components. I'm good for 2 more years anyway. I was very close to going 11 speed this year. 4/12/18 9:05 AM Campy Goes to 12!!!! I would rather see the cassettes start with a 12 tooth cog and fill a Gap in the current 12-29 11sp cassette, same for the 11-32...fill a Gap. I run 50x36 (not officially approved by Campy) with a12x29 on my current 11sp Chorus equiped bike, I very rarely use the 50x12. I like have the 12 since it give a better chain line for my 36x13. I've always questioned Shimano starting cassettes with an 11. The standard Shimano 11sp cassette is the 11x28. Crazy all these 11 tooth cogs. About the only time I use an 11 tooth cog is on my hardtail and fat bikes, but they both have 36T outer chainrings. I did use an 11 on my short-term experiment with a road 1x with a 39 tooth chainring. It was actually a bit low in some circumstances, but I can't say I missed having bigger gears.